In a bowl take your egg whites removing yolks, whisk adding sea salt and pepper. In a small skillet on medium heat add coconut oil, then egg whites. Cooking until nice and fluffy. While the egg is cooking I like to take all ingredients out and cut and chop them prior to starting the egg so everything is ready when sandwich is ready to assemble. While egg is cooking I warm the bread, then spread it with avocado. 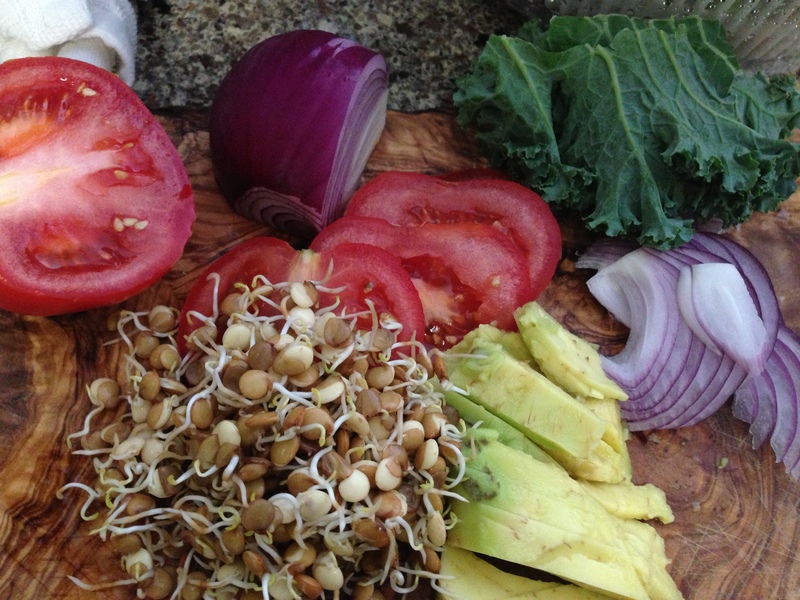 Once egg is done I take sprouted lentils and push them up against the avocado to hold them then add jalapeno, onion, tomato, kale and egg. If you do not like spicy you can omit the jalapeno. Serve once assembled. This is a fast, fresh and healthy sandwich for the whole family. It is very inexpensive and costs me about $1.50 to make with all organic ingredients. The family loves these and often we cut everything up and serve it on the table to make your own which is fun getting everyone involved in their fresh, fast and delicious food. Not only is this a very reasonable priced meal but it also packed with nutrients. We make fresh sprouts all week. All you have to do is take the lentils and put them in a bowl, covered with filtered water. On the second day throw the drained beans into a glass jar with a mesh lid that gets air. If you do not have a sprouting jar you can make your own poking holes into aluminum foil or other wrap allowing air to get escape. Each day rinse beans twice and drain. Right before your eyes you will see the lentils sprout. You can eat them raw, top them on salads or sandwiches or make a soup out of them. If you are a vegetarian this is a great meal to serve when in mixed company. 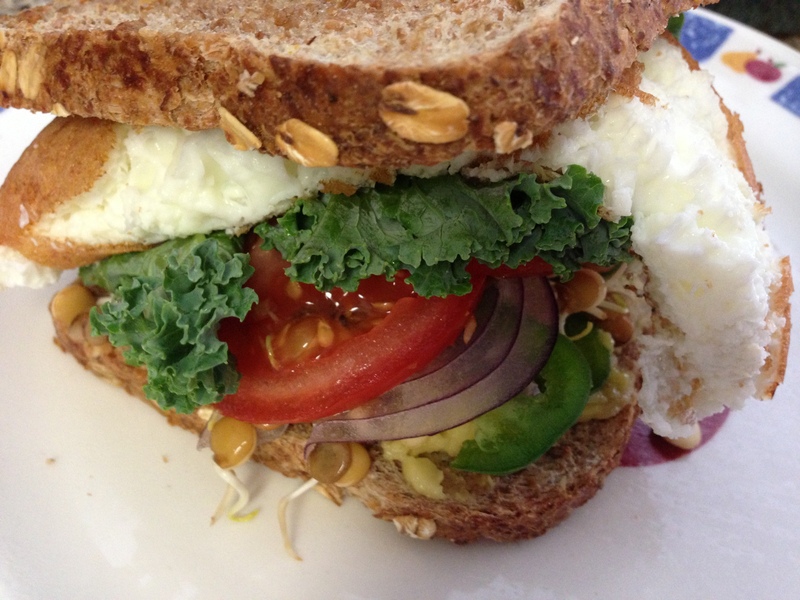 Just remove the egg and you have an avocado veggie sandwich – YUM! One of my favorites. Previous Post Commit To Eating Better & Healthier!